Marcella tends to be fairly prescriptive about her Italian dishes, as we've mentioned before, but we've found that it's best to listen to your Italian grandmother. 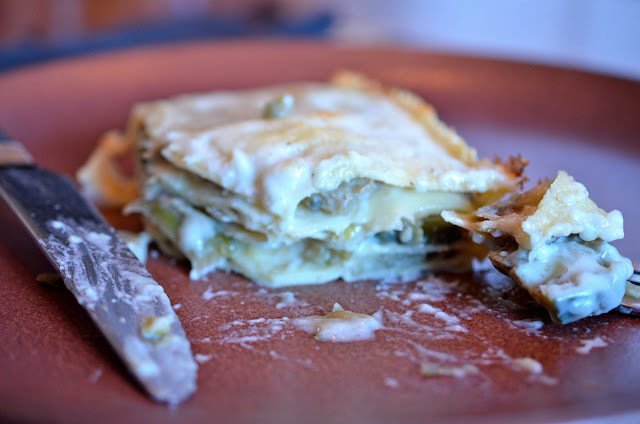 She suggests that you could use dried lasagna noodles, but that it wouldn't really do justice to the dish. She also says that you should use no fewer than 6 layers of noodles. The first time we made it with dried pasta, the second with fresh; the first time we did 5 layers of noodles, and the second time we did 6. We won't be quite as adamant as Marcella - it is delicious with dried noodles and we won't judge you if you use them. But, if you have the time and patience to make fresh noodles, it is worth it, and you'll really taste the difference. As to layers, we didn't notice any difference between 5 and 6. Fill a medium sized bowl with cold water and the juice of half a lemon, and set it aside. To prep the artichokes, first begin bending and snapping off the outermost leaves close to the base, leaving the paler green bottom. Try to pull downward when taking off the leaves so as to just peel off the inedible outer layer, while leaving as much of the edible flesh underneath as possible (see first picture below). They should break pretty easily at the right point. 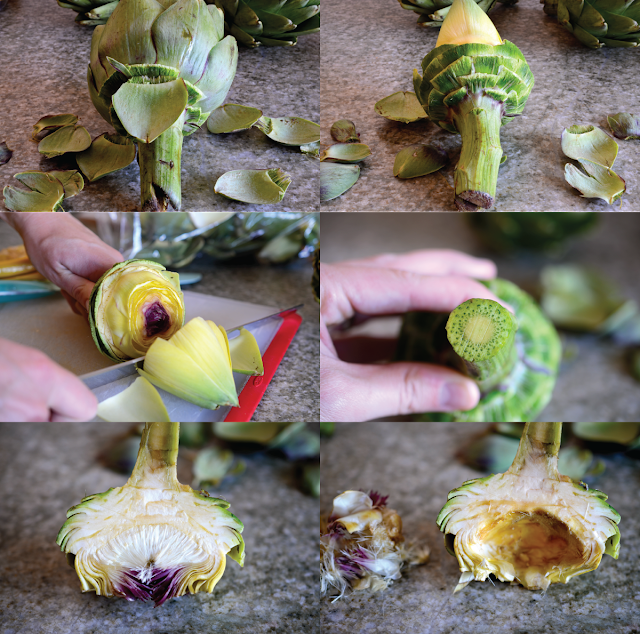 Keep doing this, working around the artichoke (the tender part will start to be higher up as you get into the artichoke), until you reach a cone of leaves that are only dark green at the tip. Slice about 2 inches off the top of that central cone, removing all the dark green part. 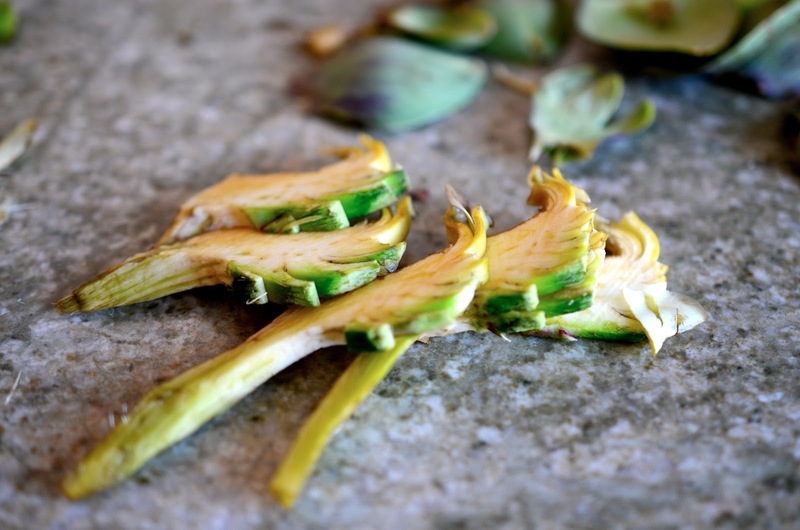 Rub the artichoke with the half lemon to keep it from turning brown. Then, take care of the stem. 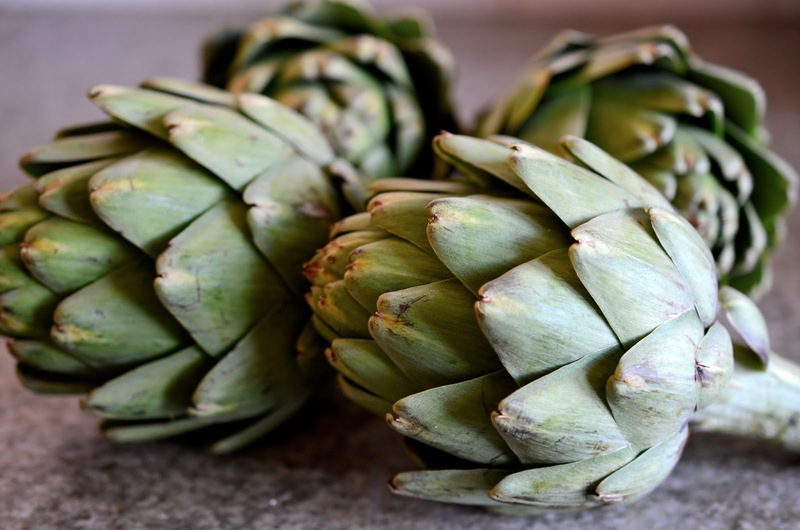 The stem has a white colored central core that is edible and delicious - if you look at the base of the artichoke you should see it very clearly. Trim off any tough end, and then use a knife to pare away the tough outer green part from the stem. Rub this with lemon, too. Now, slice the artichoke in half and use a small spoon to scrape out all the fuzzy choke from each side. Finally, slice each half thinly, and put the slices into the prepped bowl of lemony water (again, this will keep them from browning). Once you've finished trimming all of the artichokes, melt a tablespoon of butter in a wide saucepan. Drain the artichokes, rinse them, and add them to the pan with the butter and a bit of salt. Toss the artichokes in the butter and salt, then pour in water to just cover the artichokes (they will float a little bit so some will not be entirely submerged; that's okay). 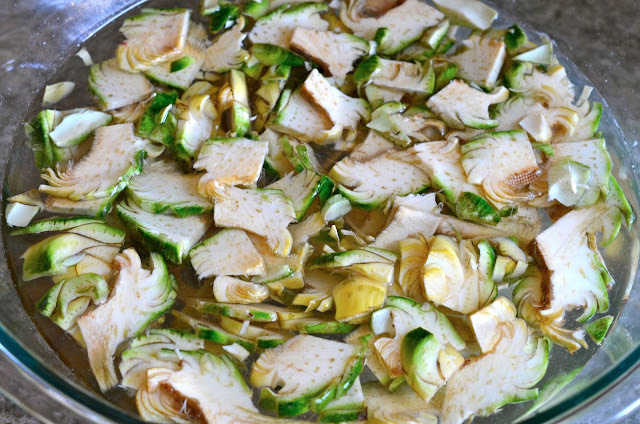 Bring the water to a gentle simmer and cook until the artichokes are tender, stirring occasionally (about 30 minutes). The water should cook away and let the artichokes brown a little bit in the pan. You can add more water if it's gone and the artichokes are not yet tender. When the artichokes are nearly done, turn the oven on to 400 degrees, move the rack to the highest position, and butter a 7 by 11 inch baking dish. 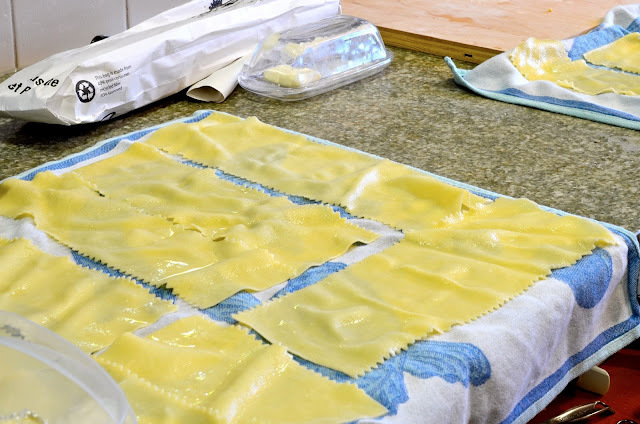 Then you can start preparing your pasta and your béchamel. 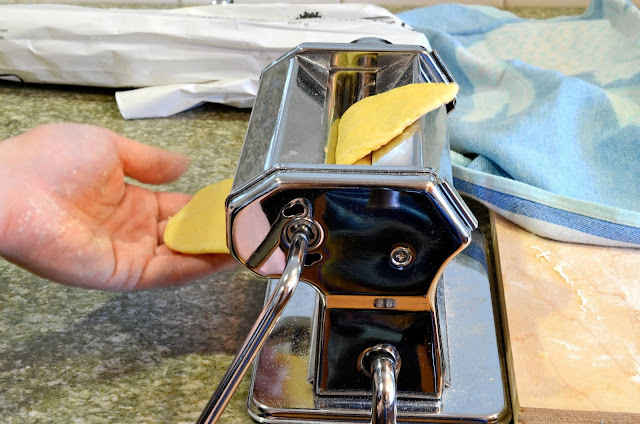 Prepare the pasta according to the box or recipe that you like (we went all out for this and made fresh pasta). For the béchamel, melt the remaining 3 tbsp of butter in a medium pan. Add the flour and let it bubble together for 2-3 minutes, then whisk in the milk. Continue whisking until the sauce has thickened to the consistency of thick cream. Season with salt and pepper. Reserve about 2/3 cup of the béchamel for the top of the lasagne, and put a little bit more in the bottom of the baking dish. Mix the rest with the cooked artichokes, then begin layering: noodles, then artichoke mixture, cheese, and more noodles, until you run out. You should have about 5 or 6 layers of pasta, and 4 or 5 layers of filling. Bake for 15 - 20 minutes on the top rack of the oven, until it's bubbling and starting to brown. Let it sit for about 5 minutes before serving. Go write haikus about artichokes. Yay you guys are back! This looks awesome, I love artichokes too! This looks great!! I know what you mean about Marcella Hazan and her prescriptiveness. Sometimes there's a particular alchemy in her recipes that has to be respected, but it's hard to know when that's the case and when she's just being persnickety. This looks delicious! Will have to try it with some Quinoa lasagna! Wow, this post is very timely. Artichokes are on my list of foods to figure out how to cook. This recipe looks amazing and thank you for the detailed artichoke pictures.